Some of my musical highlights of 2016 have been the series of jazz and soul concerts organized by Gus Zarrillo, Lidia Lopez and Miguel Uria as "Conciertos Consentidos" in Gijon. The quality of gigs has been so invariably high that it's almost a given that a good night's live music is guaranteed for all. 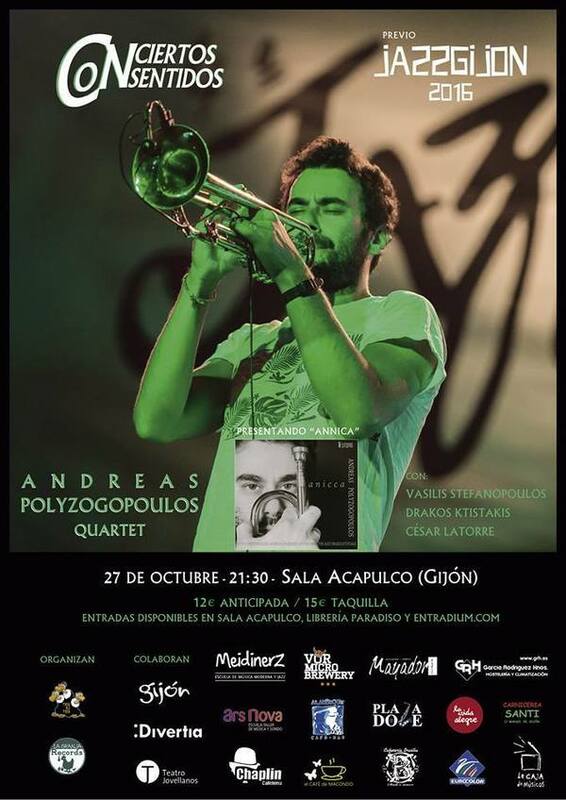 However the best gig I've seen so far - in fact one of the best gigs I've seen this year - took place at the small Cafe Plaza Doze last Friday night and featured the young and rising Greek trumpeter Andreas Polyzogopoulos and his quartet. He'd actually played the previous night at the larger Sala Acapulco and this show seemed to be an extra added at the last minute as kind of friendly informal follow-up and a chance for some local musicians get up and jam with him after the main set. His style is economic and full of soulful subtlety often recalling 50s era Miles Davis. His band - Vasilis Stefanopoulos on bass, Drakos Ktistakis on drums and featuring Asturian virtuoso César Latorre sitting in on keyboards - set up relaxed but very tight jazz/funk grooves which give him plenty of space to explore and improvise. I've not heard much of his recorded work but I get the impression his influences are pretty wide. He has even released an album of Pink Floyd cover versions which I'd love to track down. There is an ethereal spaciness in his playing which is reminiscent of some of Miles Davis early 70s work - especially In A Silent Way (one of my favourite albums ever by the way). The gig in the Plaza Doze was packed out but the audience were hushed and reverent, aware that we were witness to one of the best displays of soulful jazz artistry we've seen in a long time. It really was an outstanding show, the Conciertos Consentidos brand is now well on the way to becoming a trademark of quality. Let's hope there's much more to come. In fact I believe the next show is December 15th and features the Daniel Cano Quintet in the Sala Acapuco in Gijon. Andreas Polyzogopoulos, trumpet, Vasilis Stefanopoulos, bass, Drakos Ktistakis, drums, César Latorre, keyboards. Post main set jam with local musicians Felix Morales on drums and J.Ramon Feito on the keyboard on a fantastic version of My Funny Valentine. Ok Thanks! I've updated the post to give credit. Thank you for such a great show!